The fluent_contents module offers a widget engine to display various content on a Django page. This engine operates similary like Django CMS, FeinCMS or django-portlets, however, it can be used for any project, or CMS system. Page contents can be constructed with multiple "content items". You can define your own content items, or use one the available content items out of the box. Standard web sites could use the bundled default content items. Other advanced designs (such as a web site with a magazine-like design, having many blocks at a page) can be implemented quickly by defining content items for the various "style elements" at the page. Web editors are able to place the "content items" at the page, hence they can fill the content of advanced layouts easily and directly in the Django admin. This also applies to pages which have a "free form" or "presentation slide" design, this module allows the end-user to manage and configure the designed elements at the page. 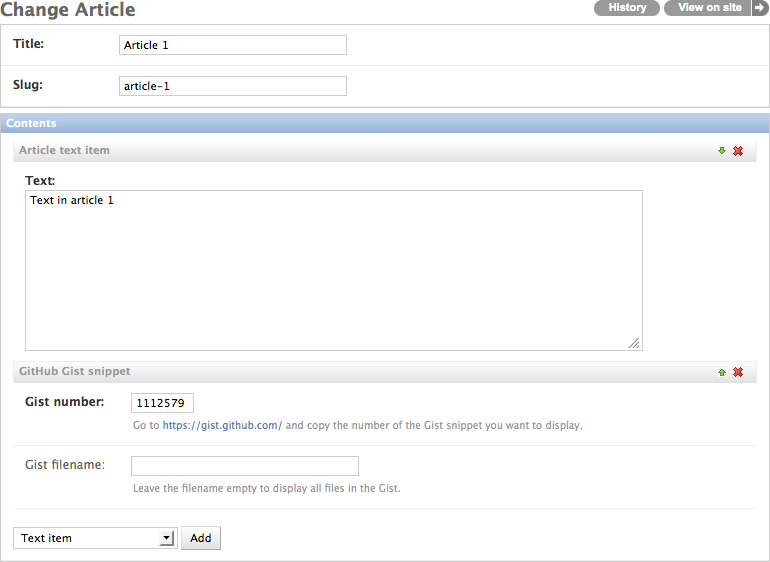 Text content - write rich text in a WYSIWYG editor (provided by django-wysiwyg). Markup - write content with reStructuredText, Markdown or Textile (provided by docutils, Markdown or textile). Forms - display forms created with django-form-designer. Google Docs viewer - display a PDF or DOCX file on a page, using the Google Docs Viewer service. OEmbed support - embed content from YouTube, Vimeo, SlideShare, Twitter, and more. Twitter feed - display a Twitter timeline, or realtime search timeline. Code - display code snippets with highlighting (provided by Pygments). Gist - display Gist snippets from Github. IFrame - display an <iframe> on the page. Raw HTML content - include jQuery snippets, or "embed codes" by other services. Commentsarea - display comments on a page (provided by django.contrib.comments). Disqusarea - display DISQUS comments on a page (provided by django-disqus). Form-designer link - display a django-form-designer form on a page. For more details, see the documentation at Read The Docs.